Phoebe was released from the hospital yesterday and got to come home. Her fluids have seemingly balanced out and it appears that her electrolytes are getting back on track. 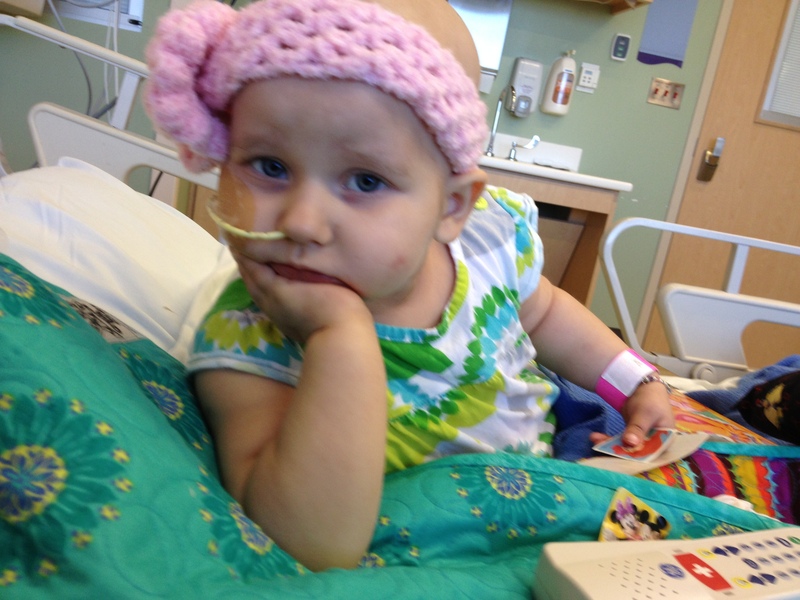 We asked to delay this next round of chemo that was scheduled to start Tuesday and it has now been moved to Friday. We are hoping for an uneventful week at HOME with her until then! Nathan and the 2 big boys went out of town for a Cub Scout campout today and I know they are having a great time. Deacon welcomed Phoebe home and we had a nice dinner with my in-laws. It was nice to get to spend some special time with the 2 littles and I also got some unpacking done. Here’s to a healthy week with everyone at home! Thank you to our friends and family who brought food, toys, clothes and coffee to the hospital. Those little things are big things! Thank you all for your prayers. Phoebes kidneys are finally responding and she has finally stabilized. Her sodium has come back down to normal and her potassium and other electrolytes are back in line. We did this with hospital intervention, meaning methods that we cannot use at home. She is still admitted at Children’s, but we are basically doing what we would do at home for 24 hours to see if she will stay stable without intervention. The last thing we want to do is have to come back again over the weekend. Thanks again for all of your love, kind words and prayers. We will keep you updated and let you know when she gets to come home. 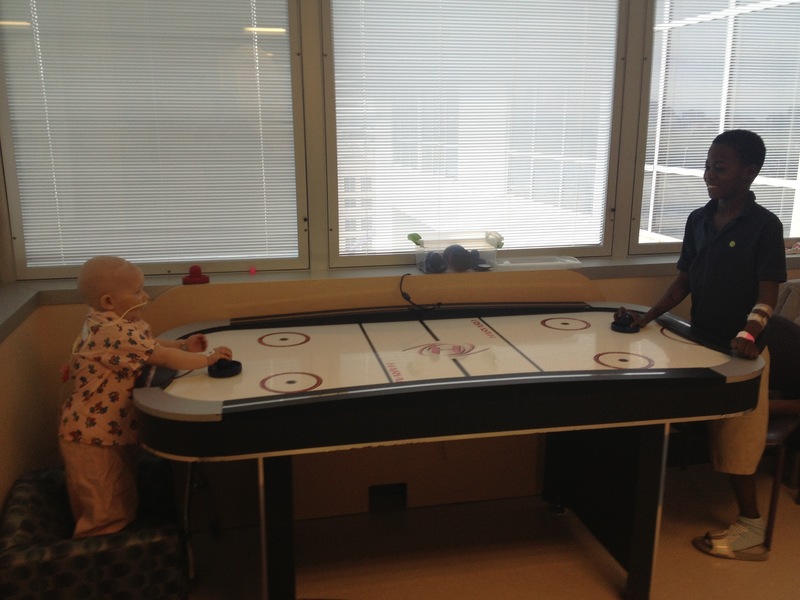 Phoebe playing air hockey with a fellow oncology patient. Phoebe was taken to Children’s last night around 1 am. Her sodium came back at 164, extremely high again. This was the issue we had last week when she was admitted. Her Vitamin K is low as well as her Chloride. Her kidneys are not functioning properly and not absorbing the vitamins and minerals her body needs and that is messing with her water and sodium levels as well. Poor electrolyte balance contributes to heart issues and she is experiencing soem of that as well. She is weak and just doesn’t feel well. Thank you for continuing to lift up our girl. I will update again when I know more. Asking for prayer tonight. Phoebe and Nathan are in the E.R. at TMF here in Tyler to get comprehensive labs drawn. She slept only an hour and a half last night, which is much less than her usual 5 or 6 and she seemed agitated most of the night. Today she seemed just “okay” but as the day wore on she began to appear more bloodshot in the eyes and she was droopy and didn’t seem right. This is the first time we have taken her to the E.R. here in Tyler and we are a little nervous about having her port accessed in a new place, especially after the fiasco the other night in the E.R. in Dallas. Please pray she will get just the right person for the job so it will be as quick and painless as possible and also that we can find out what is going with her so she can feel better. She goes in Tuesday for more chemo which is hard to believe considering all the time we’ve spent in the hospital this round. Hopefully she will get to spend this weekend at home with us…. I will post an update when we know more. Phoebe got to come home last night. The doctors peformed a couple of heart monitoring tests that showed no real issues. They suspect that Phoebe’s kidneys are not absorbing enough Potassium and that the lack of Potassium caused her heart to skip beats and have an abnormal pattern. Kidney issues are part and parcel of heavy chemo regimens and often times patients end up needing dialysis during treatment. We are not to that point yet and praying that we won’t get there. Fortunately the kidney issues usually repair after treatment has ended. She was given Potassium and her DDAVP dose was altered a bit to better balance her fluids. 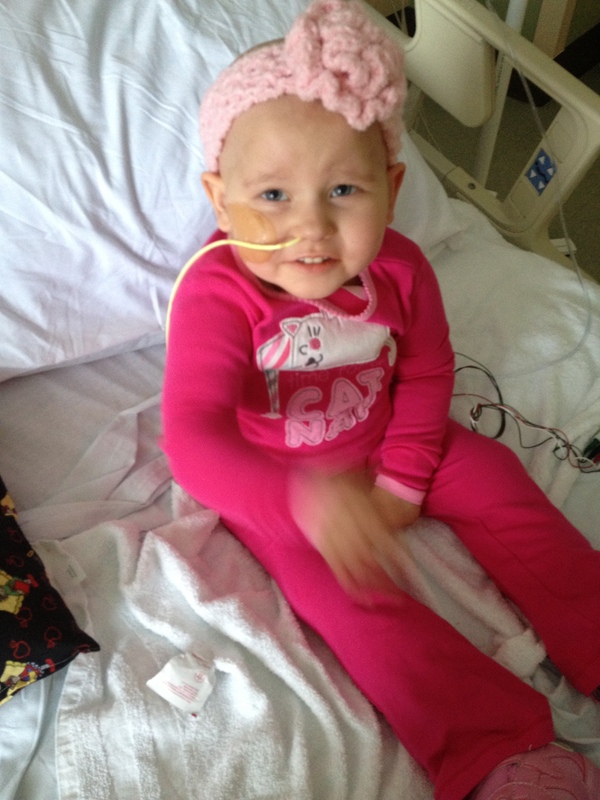 She was also given platelets and 2 blood transfusions. She is still weaker than usual and not wanting to walk or get up much. This round of chemo really took it out of her. Today Phoebe is having her labs done in Tyler for the first time. We have been meeting with care providers trying to get her therapies switched over and get services for her here in East Texas. We just had internet turned on today at the house, so I will be able to update more frequently now. We are enjoying our new home although unpacking has been difficult and slow-going with Phoebe’s needs. We have been so blessed by our FBC Lindale family and our YWAM family who spent time, energy and finances to help get our house ready for move-in and who shared the man-power to physically move us. We have truly come home to family and community and we are so humbled and blessed to be so loved and taken care of by the body of Christ. Thank you for praying for us! I will post pics as we get settled in. Feeling (and looking) like I got run over by a train this morning after our night in the ER. Phoebe got platelets, potassium, and extra fluids. She had some irregular heart rhythms that were disconcerting and her heart rate is still high. Her blood pressure is a little on the low side and she is doing a lot of sleeping. Please continue to pray for Phoebe as she is not out of the woods yet. Tonight finds us in the E.R. with Phoebe. This is the first time we have made the trip from Lindale to Dallas for an E.R. trip since our move on Monday. Phoebe finished a very strong round of chemo last week and it has completely knocked her counts down. Over the past few days we have been trying without much success to unpack boxes and get settled in our new home in Lindale because Phoebe has not been feeling well and has needed constant attention. Nathan took her in for a blood transfusion on Tuesday and she felt a little better when she came home that night, but in the past few days she has become progressively more weak and started showing deep, dark bruises on her injection sites. We called the Oncologist today to talk about Phoebe’s symptoms and he felt that Phoebe almost certainly needed a platelet transfusion and that we should come to Dallas. The only part of Phoebe’s treatment that will be done in Tyler is her regular weekly labs. Or, should an emergency arise, she would be taken to Trinity Mother Francis hospital in Tyler, stabilized and then transported to Children’s in Dallas for treatment. They simply do not treat pediatric oncology patients in Tyler and Phoebe receives continuity of care here at Children’s so we will be driving back and forth quite a bit. Tonight was a bit rough. I brought Phoebe in around 5:30 pm and five hours later she had had two separate nurses try and fail to access her port. Blood was all over her dress and we were both in tears. Phoebe is always so brave during these times and she was done crying before I was. Seeing her hurt and the endless pokes and the feeling sick and weakness and vomiting and mucositis and all the effects of the chemo just does me in. 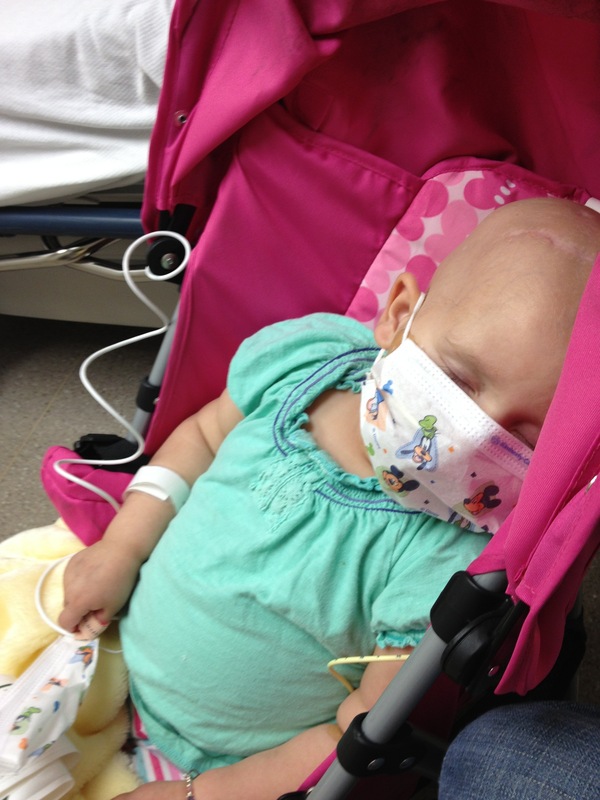 At times I feel like I’m losing my ability to bear up under the stresses of chemotherapy and it’s effects on Phoebe. I feel incapable of seeing her suffer any more. If I only had an ounce of the grace Pheobe possesses through all of this… She is such a miracle and a delight. Around 11 pm we finally got one of our favorite Hem/Onc nurses to come to Phoebe’s room in the ER and access her port. Nurse Julie was quick and kind and had that port giving blood within seconds. I really am so impressed with the Oncology nurses and many of them feel like friends. I was so thankful for Julie tonight and so was Phoebe. Phoebe’s labs came back showing that her platelets were extrememly low and her sodium was a high 159. So, we are being admitted for an overnight stay to receive platelets and get her electrolytes regulated. As I write, it is 1 am and we are still in the ER waiting for a room to come open. We are enjoying our house so much and I really wish I could post about that tonight, but I am too tired. We have been so blessed by our friends and family and church family and we are looking forward to being all settled in. Thank you all for praying for us and for Phoebe. I will be able to update more frequently when we have internet access at our house.